Light festivals are highly popular around the world as they provide ever-more spectacular, and monumental experience due to the advanced technology. This genre is still considered a novelty in the range of festivals, and in the domestic sphere it has not been available for the audience always hungry for new experiences. Last year, Pécs hosted the first light festival in Hungary, which is a curiosity in the world of this type of event. 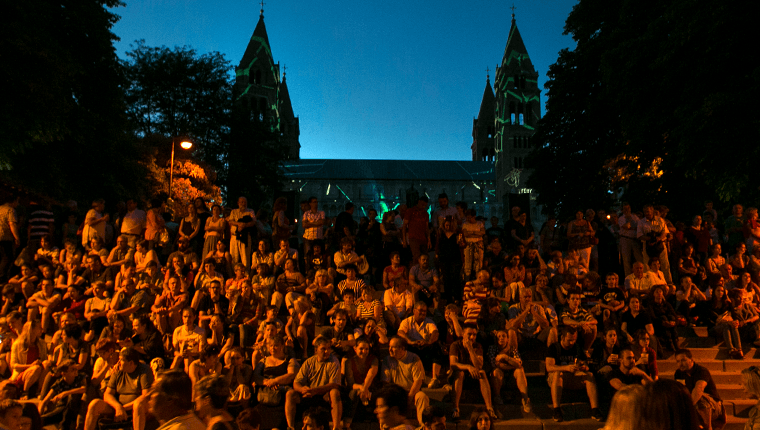 While most of the light festivals are positioned for wintertime, Pécs pioneered in scheduling a program in summer time, thereby offering an abundance of events for those interested day and night alike. Zsolnay Light Festival will complete its concept this year from June 30 June to July 2, and is preparing for a three-day event featuring the most exciting elements of the previous festival even more including the various branches of 21st-century mapping art, theatres, street entertainment, theatre, music and contemporary circus. This year's festival also places great emphasis on the integrated visualization of the triad of art, technology, science, while beside the artificial light creations, art projects using natural sunlight will also be included. The festival, which is largely free of charge and featuring outdoor events, this will also move into the city's world-class concert hall, Kodály Center, for a production. At the opening concert, the renown English artist from the electronic music scene, Emika is presenting her last year's album featuring the MÁV Symphonic Orchestra, and László Zsolt Bordos a world-famous 3D mapping artist is going to provide a unique visual background. The organizers are preparing a light-parade for the opening day of the festival, the props are made with the involvement of the audience involved, who are going to be dressed in light costumes and ride in light cars so that more and more people should be active participants and creators of the celebration. The main square of the city will host a dreamlike Contemporary Circus performance once more featuring the trapeze artists of Voala Station troupe from Spain who are going to ascend sky-high by means of a 70-ton crane. This year, the Cathedral building is offering a staggering experience again thanks to the international 3D mapping competition organized by the the internationally acclaimed Glowing Bulbs team. This gifted creative team is also producing a gigantic light installation this year, while another famous Hungarian artist, Viktor Vicsek, will also be presenting the his latest artwork to the festival's audience. As far as musical entertainment is concerned, beside the opening concert, the festival will feature such performers on the open-air stage like Félix Lajkó, who comes with the Operentzia Orchestra, or Pat Thomas from Ghana, who has been referred to as the "Golden Voice of Africa" ​since the seventies by the audience and world music press. As a returning guest, we can greet the popular Fantomatik Orchestra, one of the most striking successes of last year's festival. In addition to the concerts, the Mediterranean streets and squares of Pécs will be populated by fire-art, contemporary circus and theatre productions. The Circ Bover's award-winning performance features special scenery made of six-foot bamboo sticks, while the hairdressers of Sienta La Cabeza are going to create lighting hair installations for festival visitors of entertaining spirit. In the evenings of the festival, one can enjoy the mapping art designs projected on the city's most famous buildings along the Road of Light featuring more than twenty stations. Several mapping-art projection teams of the country are involved in the effort of creating the unprecedented spectacle, with over 10,000 square meters of projected surface, which is an outstanding attraction in Europe. Copyright © 2019 Zsolnay Heritage Management Non-profit Ltd.